Many earthlings at NASA are hoping to capture similar chemical clues for Earth-like planets beyond our solar system, also known as exo-Earths, where “exo” is Greek for “external.” Researchers are developing new technologies with the goal of building space missions that can capture not only images of these exo-Earths, but also detailed chemical portraits called spectra. Spectra separate light into its component colors in order to reveal secrets of planets’ atmospheres, climates and potential habitability. “Evidence for life is not going to look like little green people — it’s going to reveal itself in a spectrum,” said Nick Siegler, the chief technologist for NASA’s Exoplanet Exploration Program Office at the agency’s Jet Propulsion Laboratory in Pasadena, California. 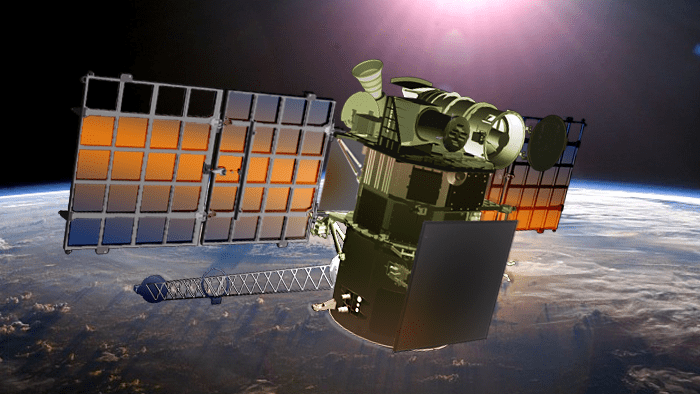 The program is helping to develop NASA’s plans for future exo-Earth imaging missions. On the road to this goal, NASA is actively developing coronagraph technology in various laboratories, including JPL. Coronagraphs are instruments introduced in the early 20th century to study our sun. They use special masks to block out light from the circular disk of the sun, so that scientists can study its outer atmosphere, or corona. Now NASA is developing more sophisticated coronagraphs to block the glaring light of other stars and reveal faint planets that might be orbiting them. Stars far outshine their planets; for example, our sun is 10 billion times brighter than Earth. That’s similar to the flood of football stadium lights next to a tiny candle. Telescopes on the ground have already used coronagraphs to take pictures of planets, but those planets are easier to photograph because they are large, bright, and orbit far from their host stars. To take a picture of Earth-size planets lying in the habitable zone of sun-like stars — the region where temperatures are just right for possible liquid oceans and lakes — will require a telescope in space. Out in space, the blurring effects of our blustery atmosphere can be avoided. ESO/SPHERE extreme adaptive optics system and coronagraphic facility on the VLT. To take a picture of Earth-size planets lying in the habitable zone of sun-like stars — the region where temperatures are just right for possible liquid oceans and lakes — will require a telescope in space. Out in space, the blurring effects of our blustery atmosphere can be avoided. Several types of coronagraphs are under development for proposed space missions. One mission, led by NASA’s Goddard Space Flight Center, Greenbelt, Maryland, is known as WFIRST. WFIRST stands for Wide-Field Infrared Survey Telescope. The WFIRST mission would be able to identify chemicals in the atmospheres of exoplanets as small as super-Earths, which are like Earth’s bigger cousins, such as Kepler-452b, a recent discovery by NASA’s Kepler mission. This would pave the way for future studies of the smaller exo-Earths. The WFIRST mission would also investigate other cosmic mysteries such as dark matter and dark energy. Engineers and scientists at JPL are busily tinkering with different coronagraph technologies for WFIRST. 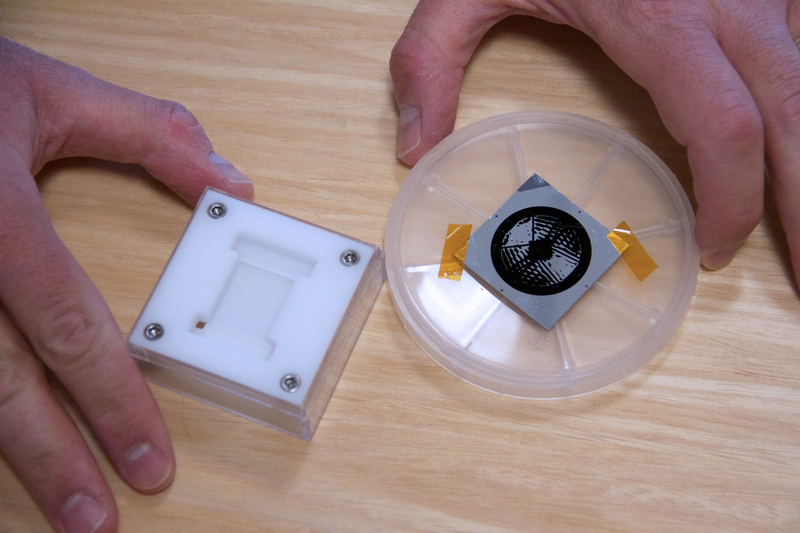 Ilya Poberezhskiy, who manages the testbeds at JPL, explained two primary coronagraph designs while holding in his hand the tiny, starlight-blocking masks. One of them, the “shaped pupil” mask, is a few centimeters across, while the “hybrid Lyot” mask is a pinprick of a dot, barely visible at only one-tenth of a millimeter in size. 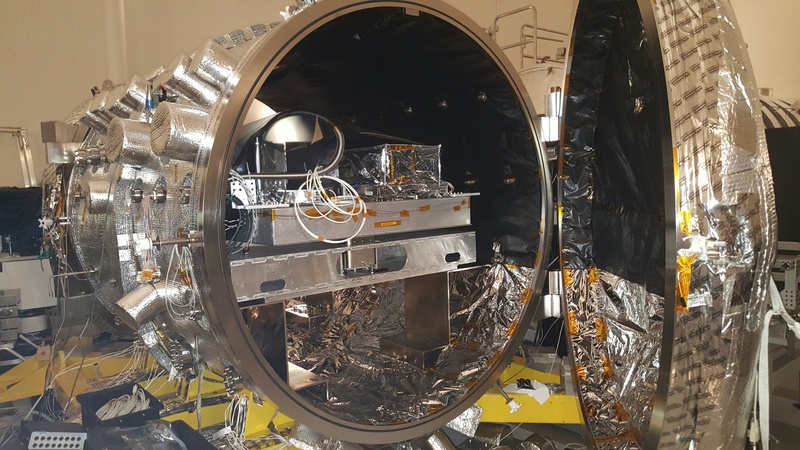 Both technologies will fly together on the WFIRST mission as a part of one instrument — the occulting mask coronagraph. “A wheel-like mechanism will rotate to switch different masks inside the instrument and convert the coronagraph from one mode to another,” said Poberezhskiy. The main challenge for coronagraphs is controlling starlight, which has a tendency to stray. Just putting a circular mask in front of the star doesn’t obstruct the light completely; starlight bends around the mask like ocean waves curving around islands in a process called diffraction. Each coronagraph type deals with this challenge differently by using multiple masks as well as mirrors that can deform to sequentially suppress starlight in various stages. 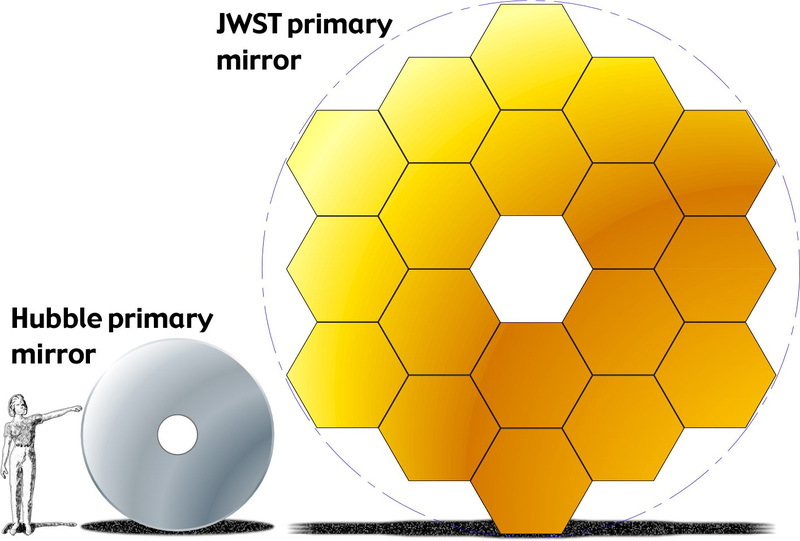 Another challenge in designing coronagraphs is adjusting for a space telescope’s tiny vibrations, or jitter. 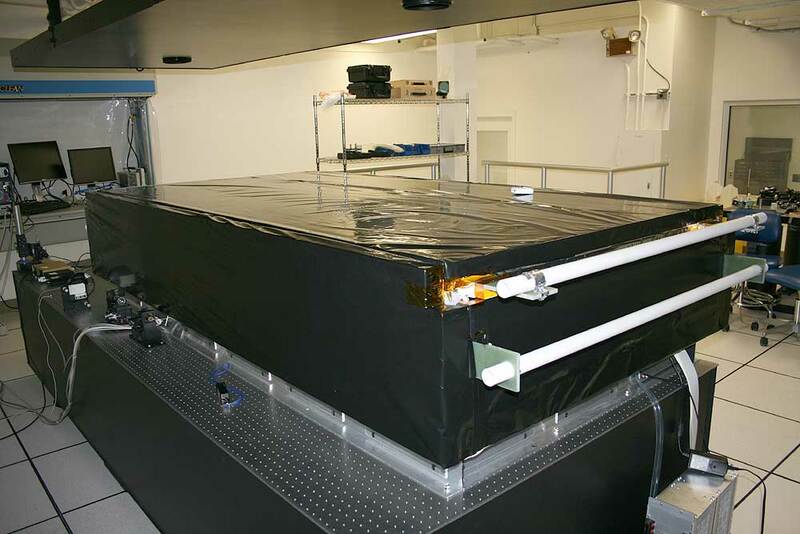 The team at JPL is assessing how their coronagraphs handle jitter by simulating the effects in a vacuum chamber. 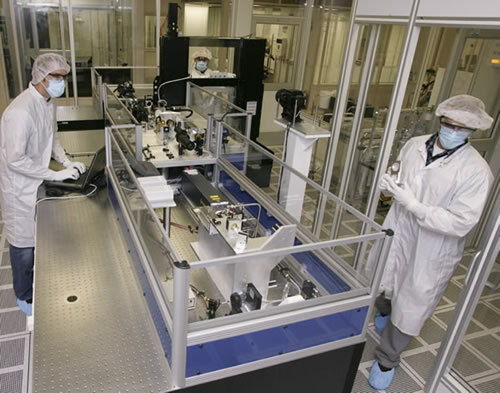 They built a table-top-size telescope simulator for the tests. The hybrid Lyot coronagraph design team is led by John Trauger of JPL. The shaped pupil coronagraph is pioneered by Jeremy Kasdin of Princeton University, New Jersey. A third technology, called a phase-induced amplitude apodization complex mask coronagraph, is being developed by Olivier Guyon of the University of Arizona, Tucson; Brian Kern of JPL’ and Ruslan Belikov and Eduardo Bendek of NASA’s Ames Research Center, Moffett Field, California. WFIRST is managed at NASA’s Goddard, with participation by JPL, the Space Telescope Science Institute in Baltimore, the Infrared Processing and Analysis Center, also in Pasadena, and a science team comprised of members from U.S. research institutions across the country.